It's Oscar week! And there's a surprisingly little in the way of Oscar watching parties. Only the Texas Theatre is rocking one as far as we know. Anyway, check out the other non-Oscar related events going on this week including our Pick of the Week at Thin Line Fest. Alamo Drafthouse: One of the best "undercover cop tries to bust a surfer bank robber gang" movies out there, POINT BREAK is screening at 8:45 pm. Alamo Drafthouse: Asian Movie Madness returns with BROTHERHOOD OF BLADES at 9:00 pm and Hopped Up Cinema returns with Rahr Brewing's special batch of beer to go along with RAISING ARIZONA at 8:00 pm. Texas Theatre: Here's an interesting chance to see some interesting part of Dallas cinema history with THE BLOOD OF JESUS on 35 mm. Campus Theater: PICK OF THE WEEK! Today marks the beginning of Denton's Thin Line Festival. 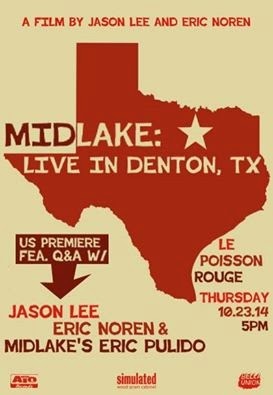 Tonight there's a screening of director Jason Lee's MIDLAKE: LIVE IN DENTON, TX at 7:30 pm. Check out the festival's website for other movies that will be showing during the festival. Alamo Drafthouse: One of my favorite romantic movies, SECRETARY screens tonight at 9:05 pm. Skip FIFTY SHADES and watch this movie. More importantly, there's a fundraising event for the Dallas Producers Association, IT CAME FROM DALLAS. It's at 7:30 pm and the doors open at 6:30 pm. Admission is free but there's a $10 suggested donation and a cash bar. The show will feature historian Gordon K. Smith featuring cult movie trailers of movies filmed in Dallas. Angelika Dallas: As part of the Oscar Classics series, there's a screening of THE GODFATHER at 7:00 pm. Texas Theatre: Spike Lee's newest movie, DA SWEET BLOOD OF JESUS at 8:00 pm and then there's a behind the screen show with Buffalo Black right after. Alamo Drafthouse: MAGIC MIKE, the surprisingly good Channing Tatum stripper movie, screens at 8:00 pm. Texas Theatre: LOGAN'S RUN will screen tonight with a special "behind the screen" show and after party right after. The movie starts at 8:00 pm and the show starts at 10:00 pm. Alamo Drafthouse: Friend of the blog Gwen Reyes will be directing a panel discussion of the controversial FIFTY SHADES OF GREY at 2:00 pm. Earlier than that you can watch a good movie such as GONE WITH THE WIND at 12:30 pm. Texas Theatre: Some sort of awards show is happening and the Theatre is holding a watching party for it at 6 pm!